Ponce Park also has a small nature trail. 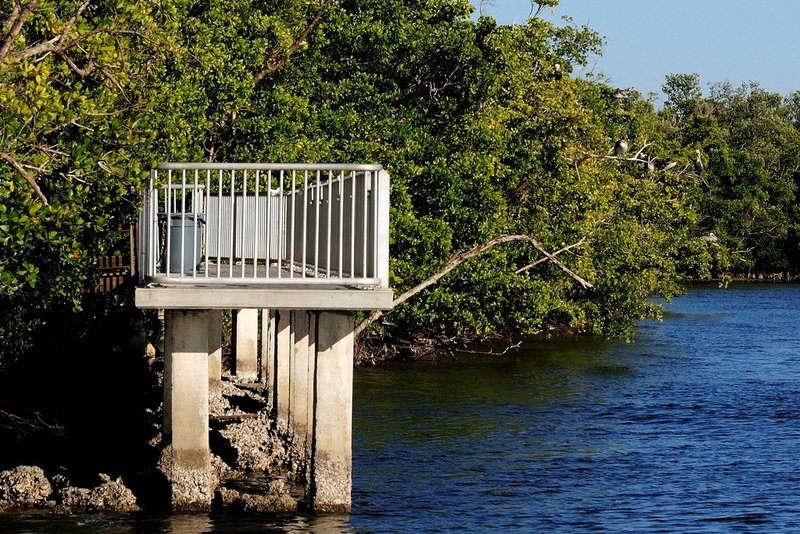 It’s basically a boardwalk through a mangrove marsh to a fishing pier along the entrance canal. The first thing you will do is cross a drainage canal. This is actually a good place for finding herons. 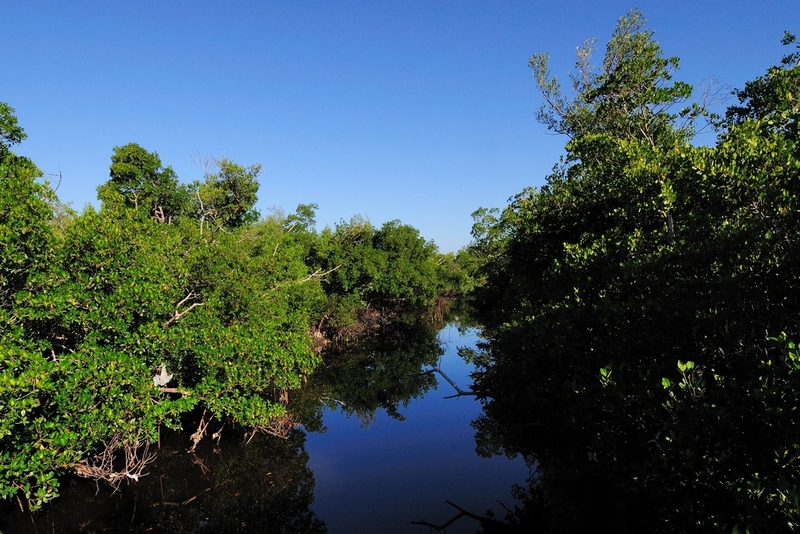 In fact, in this view of the canal, if you look very closely, you can see a Yellow Crowned Night Heron sunbathing in the mangroves on the left. The shot above was with a 12-24mm f4.0 Nikkor. I took several others of the heron with my 70-300mm f4.5-5.6 VR. The first shows him sunbathing and the second becoming suspicious while grooming. Click on either to see a larger size. So, it’s a good idea to approach the bridge gently. If you check out the reflections of the overhanging branches in the water you can see the birds before they see you. A little extra stealth and you can be in a good shooting position. This particular bird obviously was far enough away not to be threatened. 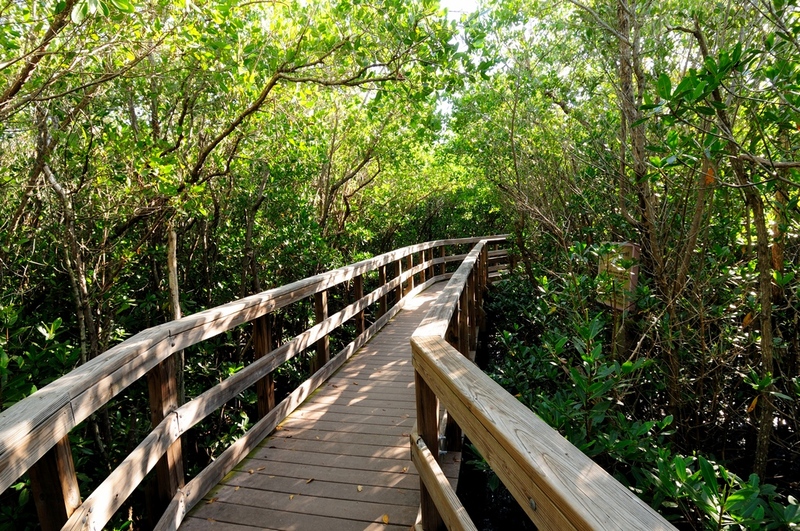 Once across the bridge, the boardwalk continues through the mangroves. Unlike the shore path, the boardwalk runs above marshy ground which will be flooded as the tide rises. It is a good place to observe Fiddler Crabs. 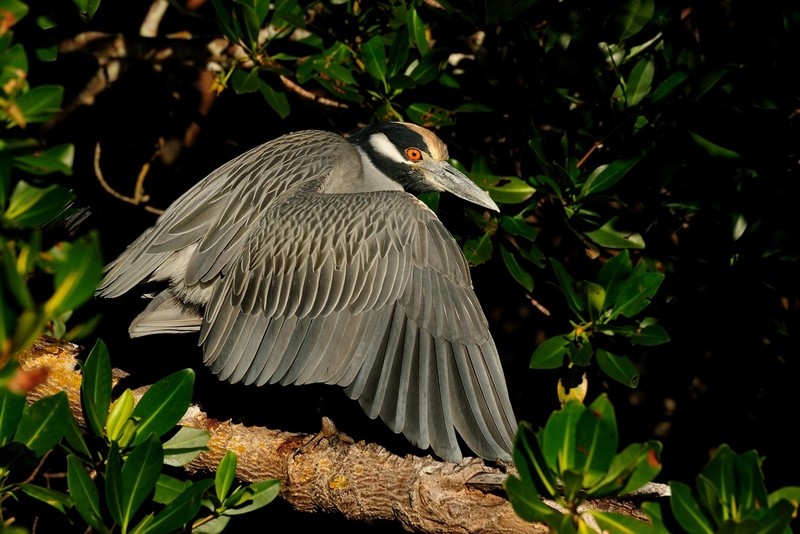 In the early morning and evening you can also see other animals in the mangroves but, they tend to blend in well and take careful watching to see. There is a junction in the boardwalk and it really doesn’t matter which side you take. 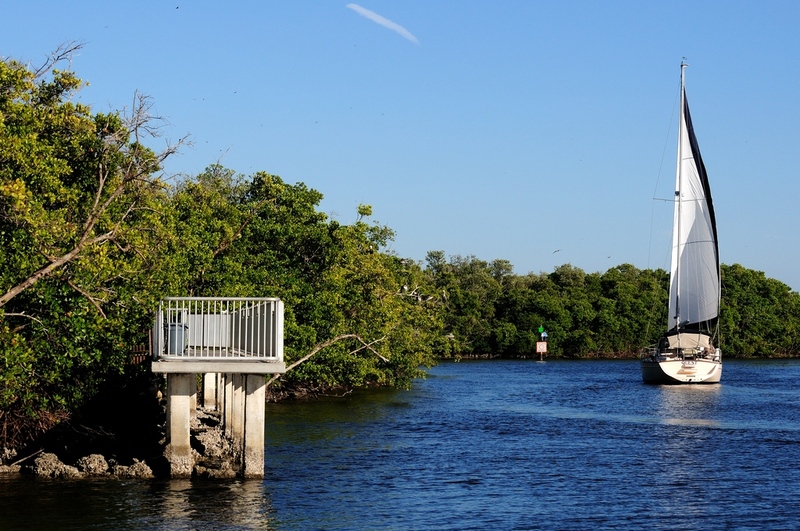 Both lead to a fishing pier overlooking the entrance canal to the Punta Gorda Isles development. This is a good place to watch boats coming and going. This picture was taken from the other fishing pier near the boatramp. You can just see the trail to the left of the metal pier. The picture on the right is a tighter crop of the one on the left. Look closely at the top right corner and you will see pelicans roosting. Click the pic for a larger view. 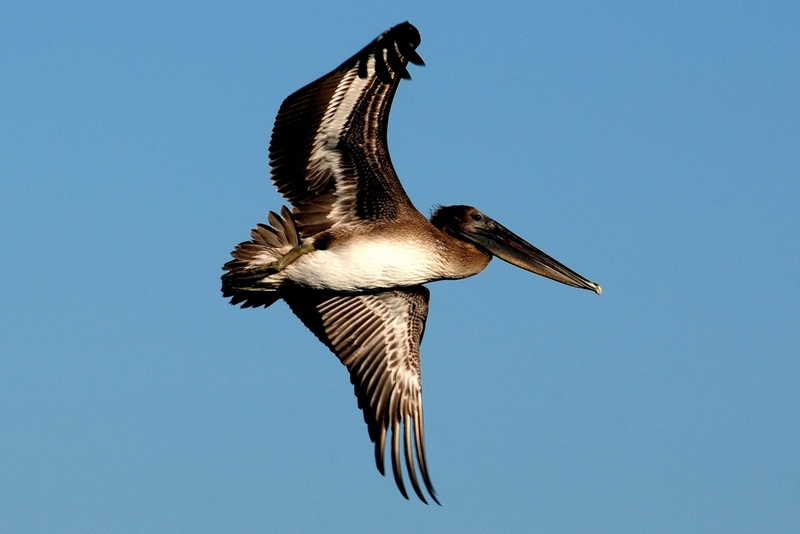 This pier and the other near the boatramp are great places to get Brown Pelicans in flight. Mornings provide the best light. The roosting pelicans below were taken in the same roosting spot from a boat and the pelican in flight from the fishing pier. 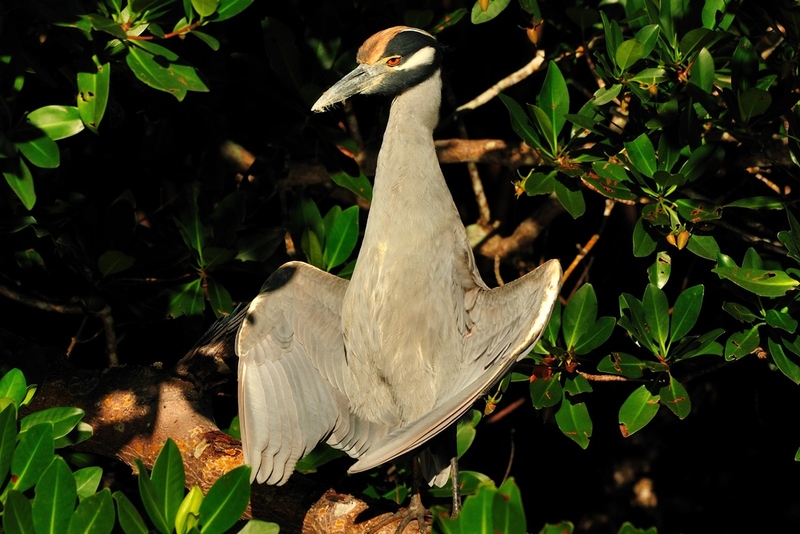 This entry was posted in Bird, Park, Park - Ponce de Leon and tagged brown pelican, Photography, Ponce de Leon Park, Yellow-cerowned Night Heron. Bookmark the permalink. Nice Pictures! 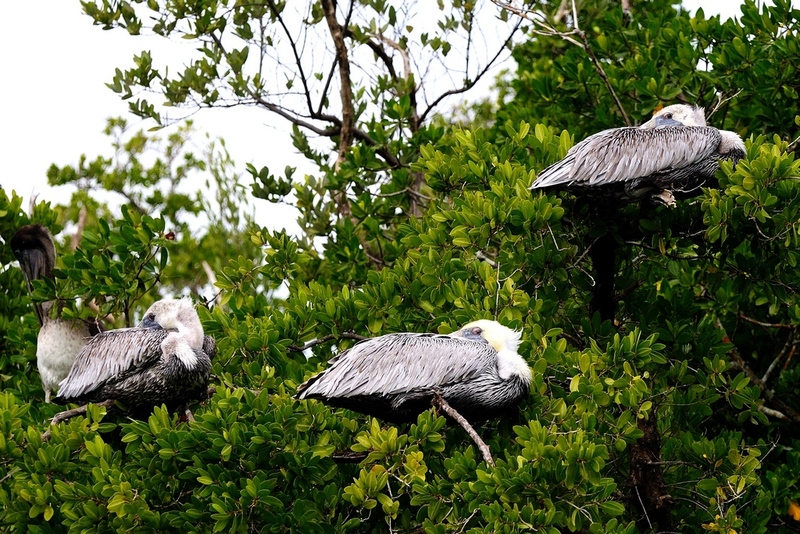 Love Ponce – great Fishing for both man & bird!